These manuals are being revised. Readers are advised to consider this prior to acting on any information they contain. 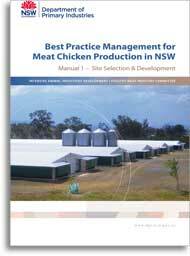 The Manuals provide guidance for the planning, design, construction, and management of meat chicken farms in NSW, with a particular focus on minimising environmental impacts. They were developed by the NSW Poultry Meat Industry Committee in conjunction with the Department of Primary Industries (NSW DPI), the Office of Environment and Heritage (OEH), the Department of Planning and Infrastructure (DP&I) and Local Government representatives, in consultation with equivalent agencies in Queensland and Victoria and industry groups. The Manuals address shed-based production (not free range) and jointly replace the NSW Meat Chicken Farming Guidelines published by the Department of Primary Industries (NSW DPI) in 2004. Growers considering building new farms, or expanding or renovating existing farms, should use Manual 1 to plan and design their farms and Manual 2 to determine the management practices they will use to minimise environmental impact. Operators of existing farms are also encouraged to use Manual 2 to determine current best management practice for operating meat chicken farms.